Ok. I am a day late but I was up all night working on the video I wanted to share with you guys. Well, as you know this is part 3 of our Yorktown investigation with White Dog Paranormal out of Chicago. The hospital is Yorktown Memorial in Yorktown, Texas. MAN!!!!!!!! What great evidence you guys are about to see!!! Anyway, we went into the first room on the right on the second floor that had like a wooden slats as part of the wall...you know...the kind you can see through. Inside was an old couch, a couple of tables and chairs, dusty books, etc.. We set up in here and began an EVP session with MaKesha Bailey reading from a children's book first..... then Belynda. I was sitting on the couch, right beside Belynda as she began to read. 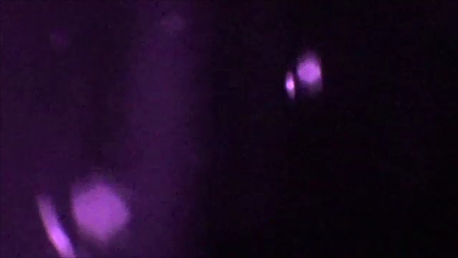 I was filming with my new Tri-Cam from Paranologies, which I LOVE, but back to the story.....and Michele with White Dog Paranormal Group was doing the video recording with her camera. 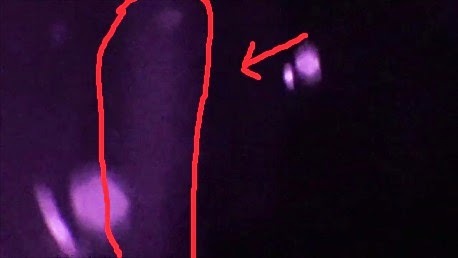 We could see on the Tri-Cam and on Michele's video a couple good orbs flying around, and here again let me caution you...there is TONS of dust floating around, so be sure to debunk what is a true orb and what isn't. Mike, the caretaker, had told us that Stacy one of the young female spirits liked to be read to upstairs in the nuns quarters so that is why we were reading the children's books out loud. As Belynda was reading...she just suddenly STOPPED!!! We all wondered what was wrong. Michele ask "Belynda, what's wrong, why did you stop reading?" Belynda laid the book down in her lap and said "I don't know...but something is VERY.......VERY.....WRONG!!!" She said she was cold as ICE and her teeth started to chatter. I was sitting right beside her and had a thermo on her and the temper started dropping down very quickly... like 15 degrees in about 3 minutes but yet, I couldn't feel any difference in the room. All of the sudden Belynda said "it's gone!" and sure enough the temperature started to go back up. Now, Michele WAS inside the room with us and then she decided she would go stand in the doorway looking out toward the hall. We asked Belynda if she wanted to continue and she said "yes". As she started reading again......Michele all of the sudden started having problems with her video camera. Now, she had been using the same video camera all night and not once did she have any problems. But for some reason, her auto focus COULDN'T FOCUS! It was like it was TRYING to focus on something........but what........there was nothing nor anyone in the hallway. Two things happen next. 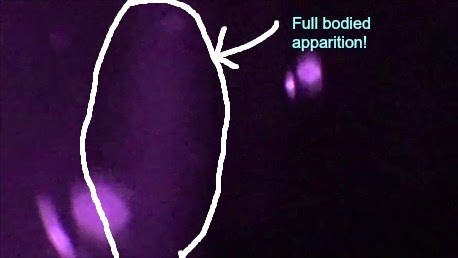 ONE........... is she steps out into the hallway to try and adjust her camera and as she is trying to figure out what is wrong.....she catches a FULL BODIED APPARITION!!!! The location of this apparition would have been right behind Belynda walking right though the wall with the wooden slats. You will see in the video that IT almost seems to "step out in the hall" and then "retreats back" as if to see Michele in the hallway. Then it steps forward and walks across the hall and almost right up to Michele before disappearing but NOT before it appears to LEAN back as if to look at Michele one more time before disappearing for good!!! CRAZY???? I KNOW IT SOUNDS CRAZY...but just wait till you see the video!!!!! of the window that is in the room. And that's not even the BEST PART!!!!! 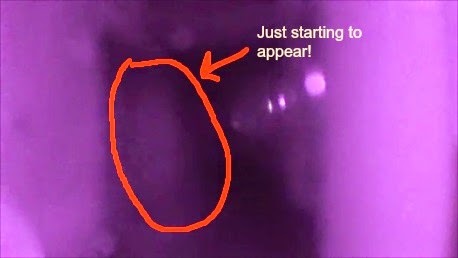 As soon as the apparition disappears, all of the sudden Michele's camera begins to focus!!! Not even 5 minutes passes, when out of the blue, or should I say dark...lol a door opens at the end of the hall!!! Yep...just opens and closes a couple times all by itself!!!! The GREAT part....Michele SEES this happen AS WELL as captures it on video!!!!!!!!!!! It was amazing!!!!!!!!! One thing that we notice is.....that it is illuminating the hallway with light???? How can that be possible????? There are no lights, and no one in the hallway but yet it is bright enough to SHINE light across the floor of the hallway!!! I CANNOT explain this!!!!! We go into the room where the door opens and closes.....and all that is in the room is an old sewing machine. And as for a window, there IS a window but it is far from the door and only a half window at that. There is NO WAY a light as bright as it was, could be coming from this window or room!!!!!!!!!!! I just wanted to post some additional photos of the place, just so you guys could get a feel for what it is like inside. Again, I used the flash so that you could see what is there, but this place is VERY DARK.....VERY COLD......AND VERY OCCUPIED!!! This is not original to the hospital. permanently down in the basement. In the priest room on the bottom floor. It this an orb or just dust??? Going into the priest bedroom downstairs. Wait....Is that an orb on Brian's back?? Misc. old stuff sitting around.